This mountain biking trail ride is open to all skill levels - we'll adjust the difficulty of the ride depending on your skill level. If you're new to mountain biking, the ride will be at a beginner level. If you're an experienced rider, we'll make it more challenging for you, so that all skill levels will have a good ride. You'll take a trip into the back country of Sinaloa state, past local farms and beautiful scenery with an opportunity to view local wildlife. We'll encounter dirt trails, tight brush, thick jungle with large trees and termite mounds, mango groves, busy brick & tile plants, and outstanding ocean views during our day, weather permitting (the route will depend on the time of year and the condition of the trails). This is always a fun tour, and a great way to get some exercise and to get up close and personal with the back country of rural Mazatlan Mexico. Trail Length: Approximately 22 km (14 miles). If you are on a cruise ship, call us and ask - we can probably arrange a later start for you if necessary. Cruise Passengers: Yes! This excursion is available to you and will work with cruise schedules. Departs: The Bike Shop in the Golden Zone. Kids: Ages 10 and up. Requirements: Must be in good physical condition, and have basic bike riding skills. Your ship doesn't offer this excursion, but you can book it here! This is a family-friendly tour, but if the group is more advanced we will certainly adjust the tour to your skill level. 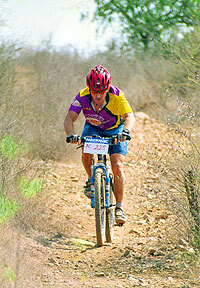 We can customize a road or mountain bike tour for you or your group as well. There are countless great places to ride in Mazatlan, we just only have these two daily scheduled tours. If you want to ride more places, just let us know - we will get your blood pumping!